Yachts are often big or fast, but in rare situations, they can be big and fast. Timeless lines that will never fail to please your critical eye. Luxury furnishings and fittings you might expect to find in a bespoke sports car or personal business jet. Performance capabilities across a wide range of conditions you would most often find in an accomplished offshore racing design. While it might seem that I’m waxing unreservedly, it’s important to note that the yacht described here is a whopping 95 feet long and weighs in over 70 tons dry. This 2003 Sunseeker 95 Predator fuses the offshore performance history and design chops of noted British naval architect Don Shead with the exclusive interior design talents of super­yacht specialist Ken Freivokh, and the proven yacht-building heritage of Sunseeker Yachts—founded in the early 1970s in the U.K. by Robert Braithwaite. 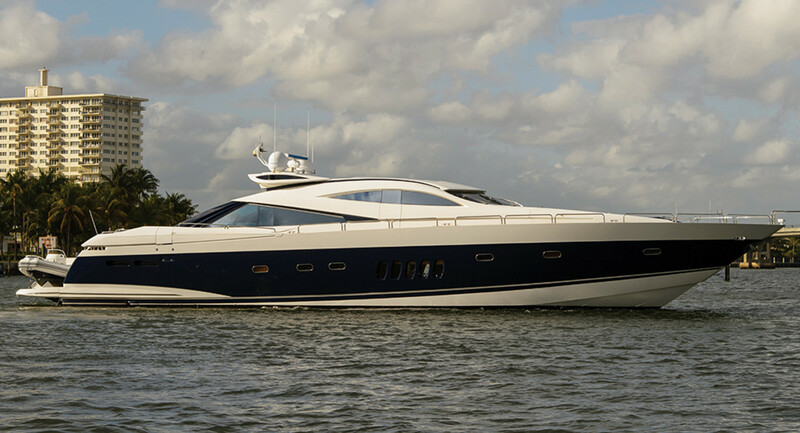 In the fall of 2015, Sunseeker celebrated its completion of 100 luxury yachts more than 100 feet in length. This Predator is very sleek for a boat just shorter than 95 feet. Performance luxury yachts are a rare breed. 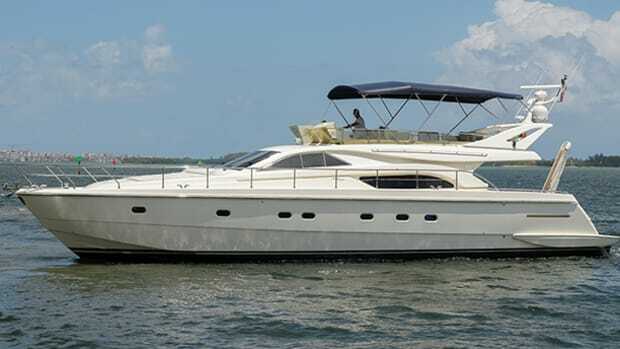 Sunseeker, Pershing, Mangusta, and Magnum are some of the more notable builders in this niche. 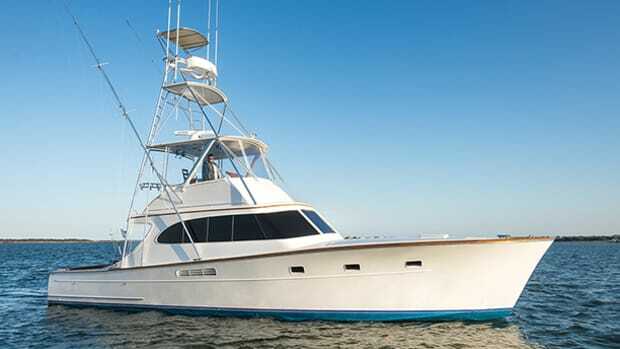 “These types of yachts appeal to successful young owners who want to go fast, look good, and live at a level of luxury that befits their contemporary lifestyle,” said Allied Marine yacht broker Dean Anthony, who listed and sold the 95 Predator Once Around, pictured here, just four months after working with the original owner, who had put the yacht on the market a couple of years earlier. 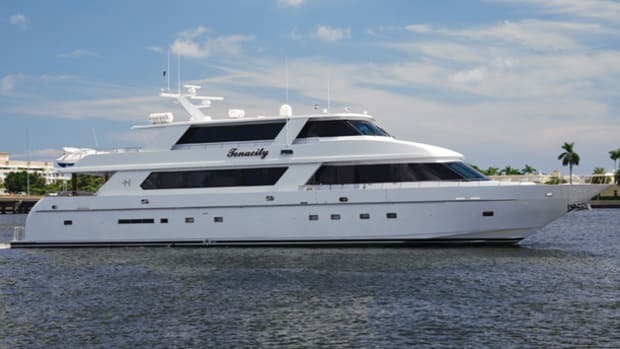 The U.S.-owned yacht was a typical listing for Anthony, who in recent years has seen overseas customers shopping for yachts in this country when the exchange rate was in their favor. But he also has a number of stateside clients who want foreign yachts. Once Around is powered by a brace of 2,000-horsepower MTU 16V 2000 M91 diesels with V-drives that offer a cruising speed in the high-20-knot range and a top-end speed of 35 knots. The company also builds this Predator with triple engines, using the same power linked to Arneson surface-drives; that propulsion will push a 95 Predator to a WOT speed of 40 knots, in the right conditions. Note the large windows in the saloon. With a transom deadrise of 20 degrees, the 95 Predator is said to ride comfortably in 3- to 4-foot waves, to corner precisely with a modest inward bank, and handle like a performance boat half its size. That’s a tribute to the offshore and superyacht design talents of Don Shead, and the engineering team at Sunseeker. A 95 Predator comes standard with a hydraulic swim platform, making it far easier to launch and retrieve a dinghy, but there also is a large garage to port in the transom that will store a second dinghy so that guests are not stranded aboard when at anchor and the first dinghy is in use. Additionally, there are crew’s quarters located to starboard behind the transom. Access to the engine room is nearby. 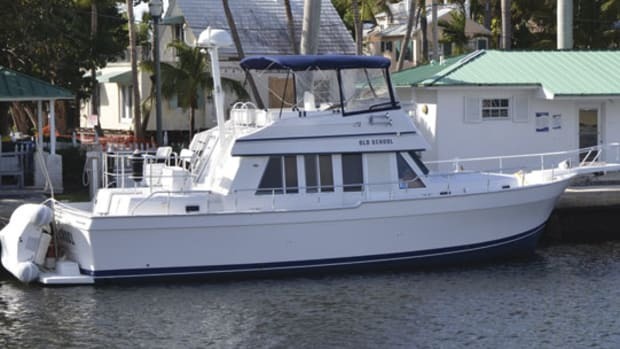 The space is amazingly well designed to accommodate two 27-kilowatt generators, two primary propulsion diesels (or in some cases three), and all the other supporting systems that make life aboard very comfortable. 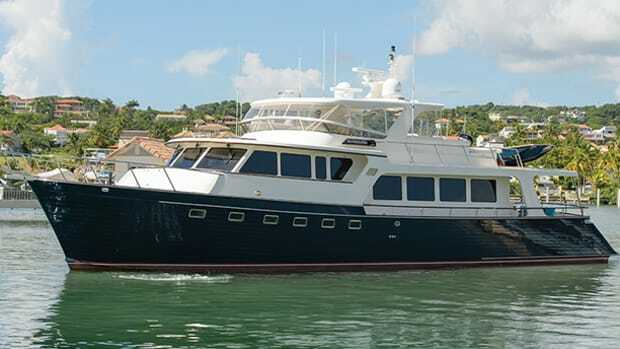 The 95 Predator’s sweeping lines encompass a large main deck area, the massive aft deck, an enclosed saloon/living area with helm forward, and spacious belowdecks accommodations in four staterooms. 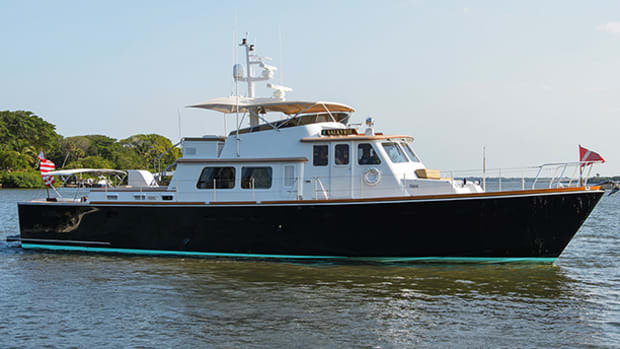 Described by some as a teak-clad terrace, the aft deck features a wide, molded lounge seat across the transom that converts electrically into a large sunpad. It’s flanked by dual stairways. There’s a dining area to port and an alfresco bar and grill to starboard; all are protected by the sweeping aft extensions of the deckhouse. A canvas shade concealed in the aft edge of the cabin top extends to protect most of the deck, and retracts when guests want a fine view of the evening stars. In the saloon, the aft bulkhead is all glass, with sliding doors that open wide to link the indoor and outdoor living areas in good weather. There is an abundance of glossy cherry and leather-upholstered furniture in the Freivokh-designed interior that’s lit by a combination of spotlights and fixed overhead skylights. The vibe is comfortable and luxurious, a fine area in which to entertain or relax in front of the 42-inch Samsung flat-screen. Side windows are smaller than expected, but touch a button and you open the sunroof forward to bring in loads of natural light and ventilation. And for those warmer days, a Dometic 6-ton chiller with dual saltwater pumps and two cold-water circulation pumps keeps all zones frosty. The brightwork gleams in the forward VIP stateroom. 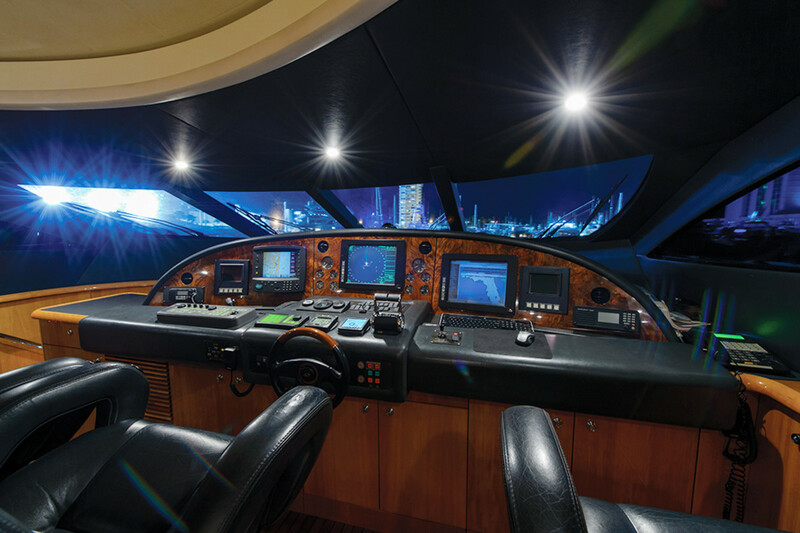 The cabin-wide helm console is furnished with four Besenzoni electric/hydraulic captain’s chairs, and a full suite of Garmin navigation and communication electronics (upgraded in 2015), as well as FLIR’s M324xp thermal night vision system. To the right of the steering wheel, the Rexroth throttle and gear controls include synchronizer and trolling valve features. The lever controlling the Side-Power hydraulic thrusters is within easy reach of the helmsman, but far enough away to prevent accidental actuation. Immediately to port and starboard of the helm station are watertight doors for quick access to the side decks. The entire helm console is shifted right of centerline, just enough to allow a companionway entrance to port. Down a curving flight of stairs, there’s a second saloon forward of amidships, as well as forward of the master stateroom. 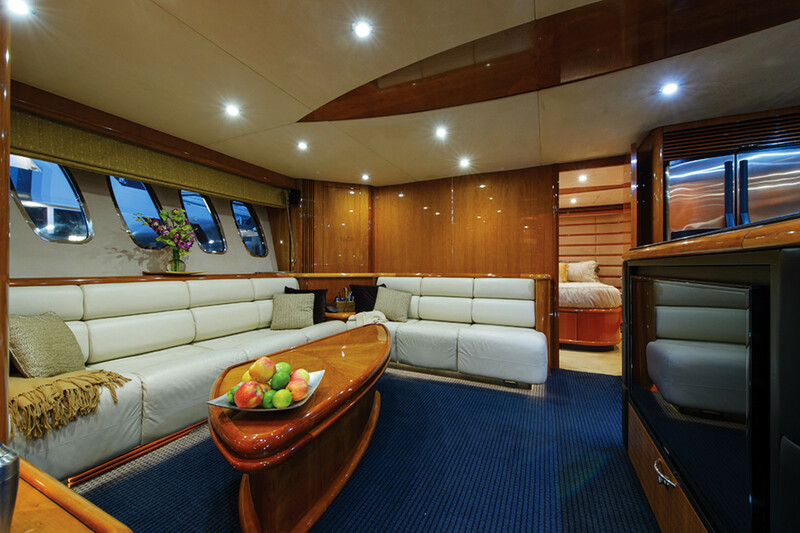 Like the main saloon, this area dazzles with cherry furniture and bulkheads, but it also mixes well with the port-side galley’s brushed stainless steel appliances and black granite countertops. Five large fixed ports on either side of this living area bring in natural light, offer good views of an anchorage, and make the space feel open. There’s a massive lounge to starboard with a custom low table (with another TV mounted to face the lounge), and a serving island separates the galley from the centerline walkway. It’s a wonderful place to get away from the upper deck activities, to eat an informal meal, or enjoy an after-hours snack when friends and family are asleep. 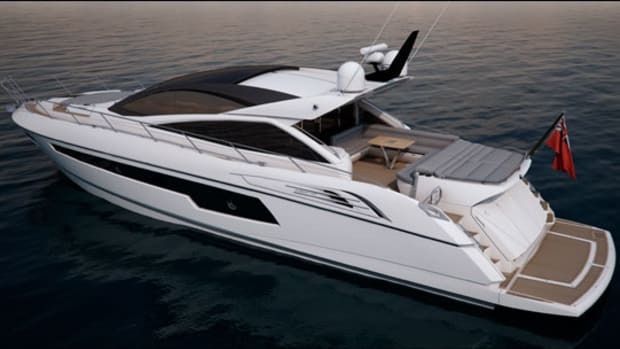 Standard layout plans for the Predator 95 show four cabins for the owners and six guests. 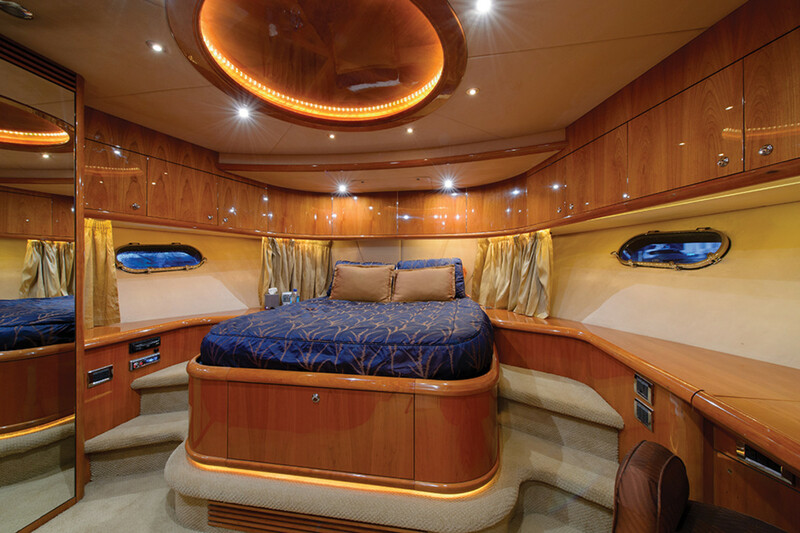 Twin-berth cabins flank the companionway leading forward, and they share a port-side head compartment. The large VIP forward has private access to an en suite head compartment. All three cabins are furnished with abundant stowage and hanging lockers. 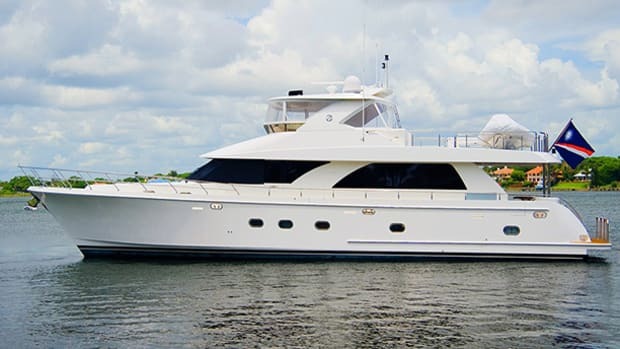 The full-beam master features a large island berth positioned amidships, with a massive walk-in closet to port and an equally massive head compartment to starboard—both abaft the bulkhead behind the headboard. A comfortable couch to port and a spacious desk to starboard, with lots of dedicated stowage, complete the layout. 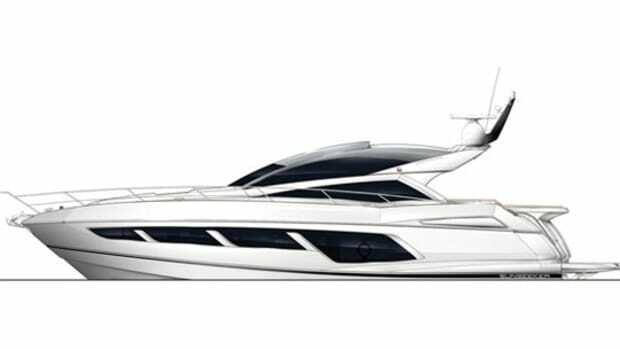 For those who want performance and luxury in a thoroughbred, offshore-capable hull, the Sunseeker 95 Predator has a lot to offer. And while you may have to search overseas for the perfect yacht, you will be one of the few who embraces style and substance afloat.